The Portland Trail Blazers might have stolen the Western Conference spotlight up to this point of the 2013-2014 season, but the Oklahoma City Thunder are following right behind. Though they lost last night to the Toronto Raptors (snapping their nine game win streak) on the second night of a back-to-back, the Oklahoma City Thunder are still 11-2 so far in the month of December. They are very much the current hottest team in the league. Kevin Durant is, of course, leading the way for OKC. He is averaging a team-high and league-high 28.3 points per game (on about 19 shots per game) while shooting 49.2% from the field and 42% from three point range. Durant is doing it all on court, dishing 4.8 assists and grabbing 8.1 rebounds per contest. While he may never be Lebron James (or the ascendant Paul George) on defense, Durant has slowly improved on that end of the court, and is averaging 1.6 steals so far this season—the highest rate of his career. Meanwhile, after rebounding from knee surgery, Russell Westbrook is contributing another outstanding all around season. To date, he is averaging 21.6 points, 6.8 assists and 5.7 rebounds per game. He is one of 17 players averaging 1.8 or more steals per game. Perhaps most importantly for the OKC offense, he is one of 24 players averaging more than 6.5 drives per game, which puts plenty of pressure on opposing defenses. Though, it is interesting to note that he is only averaging a 30.7 FG percentage on his drives, a number to watch as the year progresses. After his masterful performance against the Spurs on Saturday (31 points, 8 assists, 4 rebounds, 59% from the field), it is clear that Westbrook will be the key the the Thunder returning to the NBA Finals. The truth is that after Kevin Martin’s departure, the Thunder needed a third wheel for their offensive to work in sync. Thankfully, they it looks like they found it. Apart from Serge Ibaka, who is delivering his expected numbers—14.6 points and 9.5 rebounds per contest—the Thunder are lucky to have a bunch of youngsters, who are providing that extra help the superstar duo of the team needs. Prior to the start of the season, there were big questions about which of the role players could step up and fill the void James Harden and then Kevin Martin left behind. Up to this point of the year, thanks to the surging performances from Kevin Durant and Russell Westbrook, the Thunder seem like they have found a perfect balance. After a disappointing exit in the second round of the playoffs last season, Oklahoma City seems like it has now started to find itself. They are building their confidence and their title contention run on strong foundations. 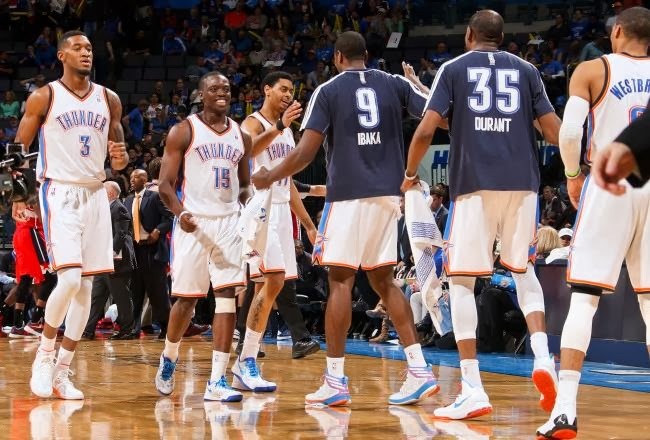 The Thunder have one of the best offenses in the league. They currently rank 3rd in points per game, putting up 105.6 points. They also rank 1st in rebounds in the NBA, while their defense is also within the Top 10 of the league. With a young emerging group of guys in multiple positions, the Oklahoma City Thunder can only stay optimistic that these promising young pieces will only improve as the season progresses. In a competitive Western Conference, they have emerged as one of the strongest title contenders in the field. As long as Kevin Durant and Russell Westbrook stay healthy, OCK fans can dream of another NBA Finals appearance. For more in-depth NBA analysis, you can find Justin Tucker’s work at www.FantasyBasketballMoneyLeagues.com. You can also get real-time updates by following the Fantasy Basketball Money Leagues Facebook page. nba daily fantasy basketball . Its a great offer. I think it would be effective for all. Thank you for sharing with us. Keep it up.daily fantasy basketball tips.